Protein Blend (Whey Protein Concentrate, 97% Whey Protein Isolate, Whey Protein Isolate), Maltodextrin, Cocoa (Processed with Alkali), Calcium Caseinate, Natural & Artificial Flavors, Gum Blend (Cellulose Gum, Xanthan Gum, Carrageenan), Veggie & Fruit Blend (Spinach Powder, Broccoli Powder, Blueberry Powder), Salt, Flaxseed Meal Powder, Soy Lecithin, Acesulfame-Potassium, Sucralose, GanedenBC30® Bacillus coagulans GBI-30 6086. Contains milk, soy and coconut ingredients. Processed in a facility that also processes egg, wheat, shellfish, fish, tree nut and peanut ingredients. Mix 1 scoop with 6 oz. of cold water or skim milk. Take at breakfast, after your workout or any other time of day. Shake well before drinking. You can customize your own shake by blending with frozen fruits, yogurt or anything else you enjoy. Protein Blend (Whey Protein Concentrate, 97% Whey Protein Isolate, Whey Protein Isolate), Maltodextrin, Cocoa (Processed with Alkali), Veggie & Fruit Blend (Spinach Powder, Broccoli Powder, Blueberry Powder), Natural & Artificial Flavors, Gum Blend (Cellulose Gum, Xanthan Gum, Carrageenan), Salt, Flaxseed Meal Powder, Soy Lecithin, Acesulfame-Potassium, Sucralose, GanedenBC30® Bacillus coagulans GBI-30 6086. Contains milk and soy ingredients. Processed in a facility that also processes egg, wheat, shellfish, fish, tree nut and peanut ingredients. 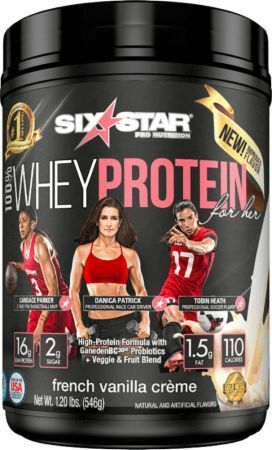 FINALLY A PROTEIN DESIGNED SPECIFICALLY FOR WOMEN! This all-new mouthwatering, delicious 100% whey protein is from the makers of MuscleTech, so you know it's a complete formula you can trust. The best female athletes in the world fuel their body’s with 100% Whey Protein for her, and so should you! Protein is an incredibly important macronutrient that our bodies need for countless important processes. Whether you are an athlete or just looking to get in better shape, introducing more high-quality protein into your diet is one of the best things you can do! Protein is an important building block of bones, muscles, cartilage, hair and nails. When you consume protein, your body breaks it down into amino acids, which are used to repair your body from daily wear and tear. Proteins are also used to help muscle growth, making it very important for keeping muscle tone and recovering faster from your workouts. Six Star 100% Whey Protein for her contains only pure, high-quality whey protein. Whey protein scores higher in biological value compared to other protein sources such as soy and egg protein. This means your body is able to break the protein down and easily digest it compared to other protein sources.